Former MP Mark Latham, Guardian writer Van Badham and two News Corp columnists Miranda Devine and Rory Gibson, appeared on Channel 7's Weekend Sunrise discussion panel on Sunday to discuss whether men have become second class citizens. Leading the discussion, Devine characterised the Government’s new anti-domestic violence ads as an “insidious attack on males and masculinity” and believes that society is changing to the position where men need to apologise for being men. “The traits that we have associated with masculinity that are crucial for the protection of our society, and also that women want in men, are being sort of criminalised and marginalised and demonised,” she said. Gibson, a fellow columnist, agreed with Devine, blaming the media for portraying men negatively. “I think that there’s a certain line of commentary that won’t rest until there’s a gender apartheid in this country,” he said. 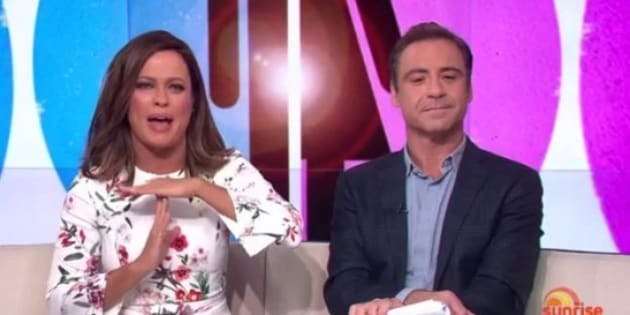 Weekend Sunrise co-host Andrew O’Keefe joined into the discussion, fighting back at the notion that men are second class citizens while copping criticism from Latham who asked "are you a participant in the show or a host?" “There’s this claim that men are suddenly second class citizens. But with the gender pay gap still at 17.5% in favour of men, women in relationships still doing twice as much of the unpaid domestic tasks as men, even when both partners are bread winners,” O'Keefe said. “Women are four times more likely to experience violence by their partner than men, women are more than ten times more likely to be killed by their partner. It’s a bit of a stretch to say that men are second class citizens. Isn't it?" Guardian columnist Van Badham criticised Devine’s comments labelling them products of “paranoia”. “I’m an advocate of the full equal rights of women for the law and attention to the traditions of our society, which has privileged men over women,” she said. “Absolutely I do not believe that all men are rapists or all men are dangerous. It’s a mischaracterisation of the movement that’s not so based on facts so much as Miranda’s paranoia. Latham, in typical form, labelled Badham’s comments as “left feminist clap trap”, before becoming engaged in a heated argument with O’Keefe. The comments of Latham are not worth reproducing, but ranged from challenging feminists to admit that the gender pay gap exists because “women work fewer hours” and personal attacks on both Badham and O’Keefe (if you're that desperate to hear them, watch the clip above). The truth of the matter is however, that we currently live in a society where, on average, one woman is killed every week at the hands of a current or former partner while one in three women has been a victim of physical or sexual violence since the age of 15. Women also make up just over half of the Australian population and while they make up 46 percent of all employees in our country, they take home on average $283.20 less than men each week. "There's an 11 percent pay gap between female workers and male workers in the 15-19-year-old age range. These are statistics from the Australian Bureau of Statistics. It is a matter of Government recognition," Badham said. So how can anyone sit on a morning breakfast show and claim that men have become second class citizens when they are evidently anything but?